The bullfighting tradition on Terceira goes back to the 16th century, due to the abundance of cattle at that time over 100,000 head, say the chroniclers - the fact that the first settlers came from provinces where bullfighting was deep-rooted and the later Castilian presence. This is why bullfighting has been practised for centuries in Terceira, the only island where bullfights are now held. It is also why a unique technique has been developed there, one that is perfectly adapted to the local conditions, the skill of the bullfighters and the tastes of the population. We are referring to the always merry and lively "bullfighting on a rope", in which the movements of the bull are conditioned by a rope held by a group of men, formerly called mascarados da corda (masked men of the rope), The bull, bred on the pastures in the central region of line island and chosen for his ability to follow figures and be cunning, has his horns padded and is then let loose in the streets of the parish, the windows and balconies of which are crowded with people on that day. Fireworks are discharged and men and bull immediately start running about, with steps that are sometimes luckier than others. 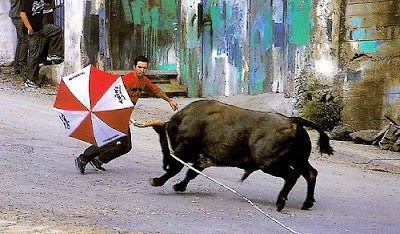 "Parasol lucky" is the colourful name that has been given to one of the manoeuvres that have been devised: it consists in putting the parasol up suddenly in front of the bull and trying to avoid his horns in the subsequent charge, while the men on the rope moderate its momentum…when they themselves are not dragged along or deliberately give the bull a little more freedom to liven up the show. "Bullfighting on a rope" has evolved with the passing of time, and one of its most recent forms - although even it is already at least forty years old - is that of bullfights by the sea, on beaches and shallows where boats are run upon for repairs. In it, everyone, including the bull, takes repeated bathes in salt water in the midst of the laughs, shouts and hisses of the spectators.